With such a wide variety of card making supplies available it can be hard to know exactly what you need to start crafting. While many specialty supplies are available, there are some basic purchases that will make it possible for you to quickly begin making your own handmade greeting cards. There are several different approaches to card making, but the following supplies are necessary for anyone who wants to make cute, quick, and affordable cards. Advanced techniques such as embossing or quilling require additional tools and materials. Die Cuts With a View Box of Cards: Die Cuts with a View makes several box card sets featuring blank cards and envelopes. This 50-card set is an assortment of basic solid colors and retails for about $13. Patterned cards are also available. Avery InkJet Cards: These cards are designed to run through your printer, which is handy if you like to use computer clip art and fonts to create your cards. They are made of heavyweight cardstock with a matte finish and cost under $15 for a pack of 20. Specialty papers, which feature different finishes, textures, or patterns, can be cut and layered on top of your card base to provide a polished look for your project. Colored Vellum: Vellum is a type of paper that is transparent, so it provides a hint of what is printed on the paper underneath. It's often used in making baby, anniversary, or wedding cards. Adhesive shows through this paper, so vellum is normally tied to the page with small scraps of ribbon. 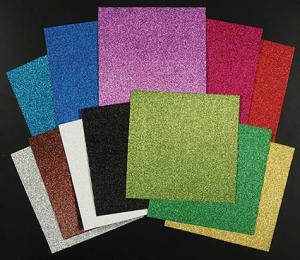 American Crafts Glitter Cardstock: Glitter cardstock gives you the look of sparkly glitter without the mess of gluing loose glitter to your page. It typically costs almost $2 per sheet, but you only need a small amount to decorate each card. Cutterpede Paper Trimmer: This trimmer is great for card making because you can purchase removable shuttles that let you make decorate scallop, zig zag, or wave cuts. It's also affordable at under $25. Cutter Bee Scissors: Priced at just over $10, these small scissors allow for precise cuts in detailed projects. They are extremely sharp, however. Make sure you store them with the safety cap on. Terrifically Tacky Tape: This double sided tape is extremely sticky and excellent for adding heavy embellishments to card projects. Scrapbook Adhesives 3D Foam Squares: These squares are used to lift embellishments off the page to provide a layered 3D effect for your card making project. Hot Off the Press Hearts Template: This template features 25 hearts in different sizes. If you're mailing a photo with your card, try making a heart shaped pocket to slip the picture in. Super Stars Template: This template features 16 different star shapes. The sheriff's badge shape would be a cute accent for a birthday card for a little boy. You could attach the badge with removable adhesive so the recipient could add it to his outfit for a day of role playing fun. Rubber stamps are the most economical card making option because the same stamp can be used multiple times. Look for stamps designed to be mounted on clear acrylic blocks, which are sold separately. These stamps are easier to store than traditional wood mounted stamps and the clear acrylic makes it easier to accurately position the stamp on the page. Fiskars All Year Greetings: This stamp set includes basic phrases to make cards for common themes such as birthdays, party invitations, and the arrival of a new baby. You get 20 different designs for $14. Technique Tuesday Stamps: These stamps by Ali Edwards are a good choice for beginning card makers because the round design makes it easy to add stamped images to metal tags or the center of a paper flower. This set retails for about $12. After you've purchased rubber stamps, you need some sort of ink product. Stamps can be used with markers or ink pads, depending upon the look you prefer. Tombow Dual Brush Pen Set: Stamping markers give you more control over the stamping experience by letting you color parts of your stamp with different shades to create a painted effect. These markers feature both wide and fine tips for detail work. You get 10 markers in vivid jewel tones for about $18. 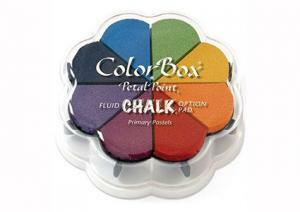 ColorBox Fluid Petal Point Chalk Inks: These inks are sold in sets that look like a large flower. Each petal of the flower is a removable ink pad. The inks are opaque, acid-free, water-proof, and smear resistant. The set of eight colors sells for about $15. 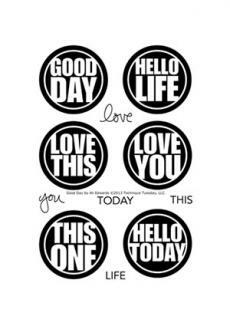 K&Company Card Quotables: This pack of stickers takes the work out of deciding what to say on your card by providing an assortment of words, phrases, and quotes for every occasion. The pack includes six sheets of stickers for about $8. K&Company Wax Envelope Seals: These stickers are designed to look like old-fashioned wax seals. They add a touch of class to the envelopes for your cards. You can pick up six seals for less than $5. 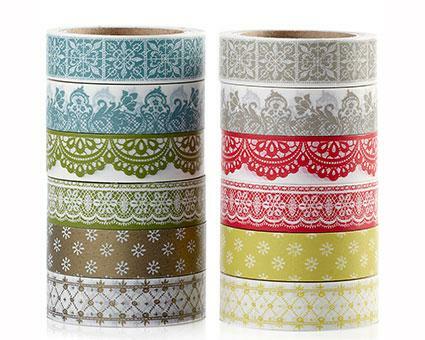 Washi Tape: Washi tape is colored printed making tape that can be used to make borders or frames on your cards. It's a simple way to add a bit of flair to any handmade card. Mulberry Paper Flowers: Tiny paper flowers add a sweet feminine touch to your card projects. Prima sells flowers in a variety of colors and sizes. This set in apothecary glass jars makes a pretty decoration for your workspace even when you're not crafting, and you can buy the set for about $20. Regardless of what card making supplies you choose to buy, remember that the most important element of the project is your creativity. Adding personal touches to the card, such as choosing papers in the recipient's favorite color, is what makes a handmade greeting a one-of-a-kind keepsake.